Heat treatment of steels is carried out for achieving the desired changes in the metallurgical structure properties of the steels. By heat treatment, steels undergo intense changes in the properties. Normally very stable steel structures are obtained when steel is heated to the high temperature austenitic state and then slowly cooled under near equilibrium conditions. This type of heat treatment, normally known as annealing or normalizing, produces a structure which has a low level of the residual stresses locked within the steel, and the structures can be predicted from the Fe (iron)- C (carbon) equilibrium diagram. However, the properties which are mostly required in the steels are high strength and hardness and these are generally accompanied by high levels of residual stresses. These are due to the metastable structures produced by non-equilibrium cooling or quenching from the austenitic state. The crystal structure of pure Fe in the solid state is known to exist in two allotropic states. From the ambient temperature and up to 910 deg C, Fe possesses a body centered cubic (bcc) lattice and is called alpha-Fe. At 910 deg C, alpha-Fe crystals turn into gamma-Fe crystals possessing a face-centered cubic (fcc) lattice. The gamma crystals retain stability up to temperature of 1400 deg C. Above this temperature they again acquire a bcc lattice which is known as delta crystals. The delta crystals differ from alpha crystals only in the temperature region of their existence. Fe has two lattice constants namely (i) 0.286 nm for bcc lattices (alpha-Fe, delta-Fe), and (ii) 0.364 nm for fcc lattices (gamma- Fe). At low temperatures, alpha-Fe shows strong ferromagnetic characteristic. This disappears when it is heated to around 770 deg C, since the lattice loses its ferromagnetic spin ordering. The state of Fe above 770 deg C is called beta-Fe. The lattice of paramagnetic beta crystals is identical to the lattice of alpha crystals. While undergoing from one form to another, Fe is capable of undercooling. This causes a difference in the position of transformation points on heating and cooling. The difference depends on the cooling rate and is termed hysteresis. The letters ‘c’ and ‘r’ indicate whether the transformation is due to heating or cooling. Further, the change in the density of alpha-Fe as it transforms to gamma-Fe results in an abrupt change in the volume of the material. Sometimes it gives rise to stresses which exceed the elastic limit and lead to failure. The density of gamma-Fe is around 4 % higher than that of alpha-Fe. The structure of steels, which are Fe-C alloys, can contain either pure C (graphite) or a chemical compound known as cementite (Fe3C) as the C enriched constituent. Cementite is present even in relatively slowly cooled steels (a long holding at higher temperatures is usually needed to decompose Fe3C to Fe and C). For this reason the Fe-C equilibrium diagram is frequently treated as the Fe-Fe3C equilibrium diagram. The Fe-C diagram is stable, while the Fe- Fe3C diagram is metastable. The Fe- C equilibrium diagram incorporating both the Fe-C stable diagram and Fe- Fe3C metastable diagram is given in Fig 1. Dashed lines stand for the stable Fe-C diagram, and solid lines denote the metastable Fe-Fe3C diagram. In the metastable Fe–Fe3C diagram, the lattices of allotropic forms of Fe (delta, gamma, and alpha) serve as sites of formation of delta, gamma, and solid solutions of C in Fe. When C depleted steels crystallize, crystals of the delta solid solution precipitate at the liquidus AB and solidus AH. The delta solid solution has a bcc lattice. At the maximum temperature of 1490 deg C, the delta solution contains 0.1 % C (point H). At 1490 deg C, a peritectic reaction takes place between the saturated delta solution and the liquid containing 0.5 % C (point B). As a result, the gamma solid solution of C in gamma Fe is formed. It contains 0.18% C (point I). If the C content is higher than 0.5 %, the gamma solid solution crystallizes directly from the liquid (at the liquidus BC and solidus IE). At 1130 deg C the limiting solubility of C in gamma Fe is close to 2.0 % (point E). Decreasing the temperature from 1130 deg C leads to lowering the C solubility in gamma- Fe at the line ES. At 723 deg C the solubility of C is 0.8 % (point S). The line ES corresponds to precipitation of Fe3C from the gamma solution. As the C content is increased, the temperature at which the gamma lattice transforms to the alpha lattice lowers, and the transformation takes place over the temperature interval corresponding to the curves GS and GP. The alpha phase precipitation curve GS intersects the Fe3C precipitation curve ES. The point S is a eutectoid point with the coordinates 723 deg C and 0.80 % C. At this point a saturated alpha solution and Fe3C precipitate simultaneously form the eutectoid concentration gamma solution. The lattice of the alpha solid solution is identical to the lattice of the delta solid solution. At the eutectoid temperature of 723 deg C the alpha solid solution contains 0.02 % C (point P). Further cooling leads to lowering of the C solubility in alpha-Fe, and at room temperature it equals a small fraction of a percent (point D). When the C content is 2 % – 4.3 %, crystallization starts with precipitation of the gamma solution at the line BC. An increase in the C content to above 4.3 % causes precipitation of Fe3C at the line CD. Precipitation of the surplus primary phase in all iron alloys containing over 2.0 % C is followed by a eutectic crystallization of the gamma solution and Fe3C at point C, whose coordinates are 1130 deg C and 4.3 % C. The line Ao is associated with a magnetic transformation which is a transition from the ferromagnetic to the paramagnetic state. In case of the stable Fe–C equilibrium diagram, because of very low rates of cooling, C (graphite) can crystallize directly from the liquid. In this case, a eutectic mixture of austenite and graphite is formed instead of the eutectic of austenite and cementite. The dashed lines In Fig 1 symbolize the Fe-graphite system. These lines are at higher temperatures than the lines of the Fe-Fe3C system. This affirms to the greater stability and closeness to a full equilibrium of the Fe-graphite system. This is also supported by the fact that heating of high C steels with a large amount of Fe3C leads to its decomposition shown by the equation Fe3C = 3Fe + C.
At intermediate rates of cooling, part of the steel can crystallize according to the graphite system and the other part according to the cementite system. Phase equilibrium lines in the diagrams of both the systems can be displaced depending on particular cooling rates. A pronounced displacement can be seen for the lines of precipitation of the C solid solution in gamma-Fe (austenite). For this reason the diagram holds completely true only with respect to the steels which are exposed to a relatively slow cooling rate. A maximum solubility of C in alpha-Fe is witnessed at 721 deg C and is equal to 0.018 % C. Subject to quenching, C can remain in the alpha solid solution, but soon precipitation of phases commences, by an aging mechanism. In a solid solution, C can form either (i) a homogeneous solution, a statically uniform interstitial distribution which is a rare case, or (ii) an inhomogeneous solution; with the formation of clusters at places where the crystal lattice structure is disturbed (grain boundaries, dislocations). The latter is the most likely state of the solid solution. The clusters thus formed represent an obstacle to the movement of dislocations during plastic deformation and are responsible for an inhomogeneous development of the deformation at the beginning of plastic flow. To analyze the influence of the C content on Fe – C alloys, every structural component is required to be considered. Slowly cooled steels comprise ferrite and cementite or ferrite and graphite. Ferrite is plastic. In the annealed state, ferrite has large elongation (around 40 %), is soft (Brinell hardness is 65 -130 depending on the crystal dimension), and is strongly ferromagnetic up to 770 deg C. At 723 deg C, 0.22 % C dissolves in ferrite, but at room temperature only thousandths of a percent of C is left in the solution. Cementite is brittle and shows higher hardness (Brinell hardness is around 800). It is weakly magnetic up to 210 deg C and is a poor conductor of electricity and heat. It has a complicated rhombic lattice. Normally a distinction is made between (i) primary Fe3C, which crystallizes from the liquid at the line CD, (ii) the secondary Fe3C, which precipitates from the gamma solution at the line ES, and (iii) tertiary Fe3C, which precipitates from the a solution at the line PQ. Graphite is soft. It is a poor conductor of electricity but transfers heat well. Graphite does not melt even at temperatures of 3000 deg C to 3500 deg C. It possesses a hexagonal lattice with the axis relation c/a higher than 2. Austenite is soft (but is harder than ferrite) and ductile. Elongation of austenite ranges from 40 % to 50 %. It has lower conductivity of heat and electricity than ferrite, and is paramagnetic. Austenite possesses an fcc lattice. The structure of the steel containing 0 % – 0.02 % C consists of ferrite and tertiary Fe3C. A further increase in the C content leads to the appearance of a new structural component which is a eutectoid of ferrite and Fe3C (pearlite). Pearlite appears first as separate inclusions between ferrite grains and then, at 0.8 % C, occupies the entire volume. Pearlite characterizes a two phase mixture, which generally has a lamellar structure. As the C content of steel is increased to a value higher than 0.8 %, secondary Fe3C is formed along with pearlite. The secondary Fe3C is shaped as needles. The amount of Fe3C increases as the C content is increased. At 2 % C, it occupies 18 % of the field of vision of the microscope. A eutectic mixture appears when the C content exceeds 2 %. In rapidly cooled steels, not all the surplus phase (ferrite or Fe3C) has time to precipitate before a eutectoid is formed. Alloys with 3.6 % C contain ledeburite (a eutectic mixture of C solid solution in gamma-Fe and Fe3C). The alloys are more properly classified with hypoeutectic white cast irons. Carbon has a noticeable effect on transformations of Fe in the solid state. The position s of the lines GS and NL in the Fe- C equilibrium diagram show that an increase in the C content leads to lowering of the point A3 and raising of the point A4 with respect to their counterparts shown in Fig 1. Hence C extends the temperature range of the delta-phase. When a eutectoid (pearlite) is formed, heating and cooling curves show a stop. This is labeled as the point A1 (Ac1 on heating and Ar1 on cooling). This phenomenon takes place at 0 .9 % C (point S in the Fe– C diagram). Precipitation of ferrite in hypo-eutectoid steels (on crossing the line GOS) shows up in heating and cooling curves as an inflection which is denoted by the point A3. The point corresponds to the gamma to alpha transformation in pure iron. Precipitation of Fe3C (crossing of the line ES), which precedes the eutectoid precipitation, is seen in the cooling curve as a weak inflection designated as the point Acm (Ac,cm on heating and Ar,cm on cooling ). Addition of C has little influence on the magnetic transformation temperature (point A2). Hence, the line MO corresponds to the magnetic transformation in steels with a low C content. In alloys containing higher amounts of C, this transformation occurs at the line GOS, which corresponds to the onset of ferrite precipitation. If the C content is higher than the one corresponding to point S, then the magnetic transformation coincides with the temperature A1. Cementite undergoes a magnetic transformation. Whatever the C content, the transformation takes place at a temperature of 210 deg C–220 deg C. It occurs without a marked hysteresis, as does the magnetic transformation of pure Fe at point A2. When steel is to be hardened, it is heated to a high temperature in order to convert the total structure to the austenite phase which is a single phase structure of Fe and C stable at high temperatures. If this heated steel is cooled slowly, the austenite transforms to pearlite, which is the equilibrium phase at room temperature. A pearlitic structure is an annealed structure and is relatively soft with low physical properties. If the heated steel is cooled very fast, a hard and strong structure called martensite forms which is a metastable phase of C dissolved in iron. This phase can be tempered to produce lower hardness structure which is less brittle. Intermediate cooling rates produce other structures such as bainite, although this type of structure is only produced in quantity in an alloy steel. Eutectoid C steel produces mainly martensite or pearlite, depending on the cooling rate. Transformation of the fcc lattice of austenite to the bcc lattice of ferrite is hindered due to the presence of dissolved C in the austenite. The austenite lattice has enough space to accommodate C atoms at the centre of the cell. The bcc lattice of ferrite does not have this space. Due to it, the solubility of C is lowered considerably on transition from austenite to ferrite. During the beta to alpha transformation, almost the entire C precipitates from the austenite lattice. In accordance with the metastable Fe–Fe3C diagram, it precipitates as cementite. This transformation can be defined by three interconnected routes namely (i) transformation of the gamma-Fe lattice to the alpha-Fe lattice, (ii) precipitation of C as Fe3C, and (iii) coagulation of the carbides. At the temperature of point A1, transformation by routes (i) and (ii) proceeds almost simultaneously, with the formation of a lamellar mixture of ferrite and cementite. Atoms of dissolved C are distributed randomly in the lattice. Due to it, Fe3C nucleates in C rich regions and ferrite in the regions which have little if any carbon. Such a redistribution of C takes place through diffusion and depends on temperature and time. When hypo-eutectoid steel containing less than 0.8 % C is subjected to slow cooling, the transformation starts with the formation of ferrite at grain boundary. This grain boundary acts as ferrite crystallization centre. Carbon is forced inside the crystallite. As ferrite precipitates, a concentration necessary for the ferrite formation is achieved in central volume. When hyper-eutectoid steel (C more than 0.8 %) is subjected to slow cooling, on crossing the line ES, Fe3C starts precipitating at the grain boundary. Here the grain boundary also serves as crystallization site. The C diffusion rate in the lattices of gamma- Fe and alpha-Fe decreases rapidly as the temperature is lowered, since the diffusion coefficient depends on temperature. Presenting an appropriate cooling rate, undercooling can be enhanced to such an extent which makes the formation of pearlite impossible. In the range of low temperatures, the transformation mechanism and the features of the formed structure depend solely on the temperature at which the transformation takes place. Considering the degree of undercooling, three transformation temperature ranges are distinguished namely (i) pearlite range, (ii) intermediate range, and (iii) martensite range. Continuous transition from one transformation mechanism to another can take place over these temperature ranges. The processes of transformation strongly depend on the content of C and other elements in steel. They can commence by a more rapid mechanism and end by a slower one. In the pearlite range, the transformation is characterized by the simultaneous formation of a mixture of ferrite and carbide. Free ferrite or carbide can precipitate at the austenite grain boundary. Here the formation and growth of both phases are controlled by diffusion processes. Diffusion of Fe and other elements plays a significant part. The structure fineness is enhanced as the temperature is lowered, until a longer time is required for diffusion crystallization of ferrite and carbides. Pearlite is a mechanical mixture of ferrite and carbide plates which is formed on transformation in the pearlite range. The rate at which nuclei of pearlite crystallization are formed depends on super-saturation of austenite with carbide, which increases as the temperature is lowered. The rate also depends on the diffusion rate, which decreases with temperature. The growth of pearlite isles depends mainly on the diffusion rate of C and Fe atoms. The other factors are (i) the degree of super-saturation and (ii) the free energy advantage during the ferrite formation. Pearlite isles grow not only through the formation of new plates but also by way of further growth of old plates in all directions. Carbide plates grow faster than ferrite plates. The process of pearlite formation starts with the formation of ferrite nuclei. Multiple alternations of nucleation of ferrite and cementite plates and branching of the plates of both phases lead to the formation of plane-parallel and fan-shaped pearlite plates. Pearlite nuclei appear predominantly in the lattice regions with crystal structure defects like grain boundaries, insoluble carbides, or nonmetal inclusions. A very significant feature of pearlite is the plate-to-plate spacing. Strength properties of steel improve with a decrease in the spacing. The formation rate of Fe3C and ferrite crystallization centres in the pearlite range accelerates as the temperature is lowered. The plate-to-plate spacing decreases when the fineness of the structure increases. An important feature which affects the properties of steel is the dimension of the pearlite colony. A decrease in the colony dimension is accompanied by a growth of the impact strength and decrease of brittleness. The critical brittleness temperature depends on the pearlite morphology. Thus a relatively high strength pearlite is formed in the case of the breaking of ferrite and cementite plates, forming a high density of dislocations inside the ferrite. A better fracture strength of pearlite is achieved through spheroidization of Fe3C particles. The spheroidization can be facilitated by deformation of pearlite, subsequent heating, and holding at a temperature near Ac1. Another method providing relatively high strength and ductility of pearlite consists in deformation during pearlite transformation. This leads to the formation of a polygonal structure and spheroidization of cementite. The yield stress (YS) of the ferrite–pearlite mixture depends on the properties of ferrite and pearlite in an additive manner. During the transformation of austenite in the hypo-eutectoid and hyper-eutectoid steels, the pearlite transformation is preceded by precipitation of excess phases namely ferrite and secondary cementite. The relative amount of the structurally free excess phase depends on the degree of austenite undercooling. The amount of excess ferrite or Fe3C decreases with an increase in the cooling rate. When there is adequate degree of undercooling, the formation of an excess phase as an independent structural component can be avoided. When hypo-eutectoid steel containing a small amount of eutectoid austenite is exposed to slow cooling, eutectoid ferrite grows on the grains of excess ferrite and eutectoid Fe3C is left as structurally free inter layers at grain boundary. In hyper-eutectoid steel, the eutectoid can also be subject to structural degeneration. Cementite, which is formed because of the eutectoid precipitation under a very low cooling below the point A1 (above 700 deg C) is deposited on secondary cementite. Areas of structurally free ferrite are noticed alongside. This eutectoid transformation, which is accompanied by separation of the phases, is considered as abnormal. In normal eutectoid transformation, ferrite and Fe3C grow together in the form of colonies with a regular alternation of the two phases. In the case of unusual transformation, a coarse mixture of ferrite and Fe3C does not have a distinctive eutectoid structure. During a eutectoid transformation the mechanism can change from abnormal to normal. Hence, with a rapid cooling and a correspondingly pronounced undercooling of austenite, the abnormal transformation can be suppressed altogether. In case of excess ferrite in hypo-eutectoid steels, ferrite is found in two forms namely (i) compact equi-axial grains, and (ii) oriented Widmanstätten plates. Compact precipitates of hypo-eutectoid ferrite appear largely at austenite grain boundary whereas Widmanstätten plates are formed inside grains. The Widmanstätten ferrite is observed only in steels with less than 0.4 % C and rather coarse grains of austenite. As the dimensions of austenite grains decrease, the share of ferrite in the form equi-axial grains grows. Widmanstätten ferrite is formed over the temperature interval from A3 (50 deg C) to 600 deg C to 550 deg C. With an increase in the C content of steel, the share of the Widmanstätten ferrite in the structure lowers. Widmanstätten ferrite is supposed to be formed owing to a shear gamma – alpha rearrangement of the lattice, which is accompanied by an ordered interrelated movement of atoms. Equi-axial grains of ferrite grow by a normal diffusive rearrangement of the lattice with a disordered transition of atoms across the gamma/alpha boundary. One of the methods used to strengthen steels consists in providing a structure with hypo-eutectoid ferrite containing dispersed carbide precipitates. To produce such a structure, steel is to be heated until special carbides dissolve in austenite and then cooled rapidly so as to preclude the usual precipitation of carbide directly from austenite before hypo-eutectoid ferrite starts forming. Transformation of martensite is due to the quenching (quick cooling) of the high temperature phase. The main characteristics of the martensite transformation in C steels are given below. Martensite transformation takes place due to the fast cooling of steel from a temperature above A1 say in water. Due to fast cooling, diffusive precipitation of austenite to a two phase mixture of ferrite and carbide is suppressed. The concentration of C in martensite matches that in austenite. Martensite transformation takes place without any diffusion. Transformation of austenite to martensite starts from the martensite start temperature (Ms). Ms usually does not depend on the cooling rate. Martensite is formed over a certain temperature interval. The particular temperature is determined by the C content of the steel. Termination of cooling over the temperature interval Ms-Mf (martensite finish) suspends formation of martensite. This feature distinguishes the martensite transformation from the pearlite transformation. In pearlite transformation, transformation continues to the end at a constant temperature below the point A1, and the final result is a complete disappearance of austenite given a sufficient isothermal holding time. With the martensite transformation, a certain amount of retained austenite is left. Martensite transformation has no incubation period. A certain amount of martensite is formed instantaneously below the temperature Ms.
On cooling below Ms, the amount of martensite increases quickly due to the quick formation of new plates. The initially formed plates do not grow with time. Martensite lattice is regularly oriented relative to the austenite lattice. A certain orientation relationship exists between the lattices. The Ms-temperature characterizes a steel of a certain composition which has been subjected to a particular pretreatment. In given steel, the martensite transformation starts at the same temperature whatever the cooling rate. This temperature depends on the steel composition and decreases greatly as the C content of the steel is increased. Part of the C enters carbides, which coexist with austenite. The carbides dissolve in austenite if the quenching temperature is increased. Therefore, the C concentration of austenite increases and the Ms point lowers. Martensite formation is regarded as a shear mechanism of the austenite lattice rearrangement. The martensitic (shear) mechanism of phase transformation is well-known by an ordered interrelated movement of atoms to distances shorter than the interatomic spacing, and the atoms do not exchange places. An atom in the initial phase preserves its neighbors in the martensite phase. This is the main feature specific to a shear rearrangement of the lattice. This nature of the lattice rearrangement provides coherence of the boundary between the old and new phases. Coherence (elastic conjugation) of lattices at the boundary between martensite and the initial phase ensures a very fast movement of the boundary toward the matrix even at low temperatures. The atoms move cooperatively to distances shorter than the interatomic spacing resulting into the growth of the martensite crystal. With the growth of the martensite crystal, an elastic strain accumulates at the coherence boundary. On reaching the YS, coherence is disturbed. Atoms become disordered at the boundary between the martensite crystal and the starting matrix. Slipping movement of the boundary is rendered impossible. Hence, growth of the crystal by the martensitic mechanism is terminated, and afterwards the crystal can grow by diffusion only. But the martensite transformation takes place at low temperatures, where the diffusion rate is very small. Hence, after coherence is broken, little if any growth of the martensite crystal is observed. The polymorphous transformation of solid solutions by the martensitic mechanism is characterized by the absence of diffusive redistribution of the components. The conditions which are necessary for the martensitic mechanism by which the high temperature phase transforms to the low temperature phase are described here. The martensite transformation is not possible at a small undercooling. This is due to the fact that in the case of a disordered rearrangement of the lattice, elastic deformation is determined by changes in the volume only, whereas with the martensite transformation additionally depends on the coherence of the lattices of the initial and martensite crystals. As the degree of undercooling is increased, the disordered rearrangement rate of the lattice increases, achieves a maximum, and then drops. To get the martensitic mechanism of polymorphous transformation in Fe, steel is to be strongly overheated in the gamma range and then cooled very quickly to suppress development of the normal transformation. During the martensite formation, there is the rearrangement of the fcc lattice of austenite to the bcc tetragonal lattice of martensite, which is similar to the bcc lattice of alpha-Fe. The austenite lattice transforms into the martensite lattice through the Bain deformation which consists in compression of the tetragonal cell of austenite along the c-axis and a simultaneous increase in dimensions along the a-axis. The degree of the tetragonal distortion of the martensite lattice, c/a, grows directly as the C concentration of martensite. The martensite lattice retains tetragonality at room temperature. The orientation relationship of the initial and martensite phases has been established. There are many hypotheses for the nature of martensite nucleation. Many of them advocate a heterogeneous nucleation at special defect sites in the starting matrix. Martensite is divided into two basic types with regards to morphology. These are plate martensite and massive martensite. They are different in shape, mutual arrangement of crystals, substructure, and habit plane. Plate (needle) martensite is found more often in high C steel. Martensite crystals are shaped as thin lenticular plates. Plates which appear first pass throughout the unit, divide it into separate parts. But they cannot cross the matrix grain boundary. Hence, the plate dimension is limited by the dimension of the austenite grain. New martensite plates are formed in austenite sections. Here the plate dimension is limited to the dimension of the section. If the austenite grain is small, martensite plates are so fine that the needle structure of martensite cannot be seen in the micro-section specimens. Such martensite is called structure less martensite, and it is most desirable. Massive (lath) martensite can be observed in low C steel and medium C steel. Crystals of this type of martensite are shaped as interconnected plates having approximately the same orientation. Plates of massive martensite are separated with low-angle boundaries. Transformation of bainite is intermediate between pearlite and martensite transformations. The kinetics of transformation of bainite and the structure formed shows features of both diffusive pearlite transformation and diffusion less martensite transformation. A mixture of ferrite and carbide is formed as a result of this transformation. This mixture is called bainite. The bainite transformation mechanism involves gamma to alpha rearrangement of the lattice, redistribution of C, and precipitation of carbide. Closeness of the bainite transformation to its pearlite and martensite counterparts is explained here. The diffusive movement of atoms of the basic component, Fe, is almost completely suppressed over the bainite transformation range. Then the gamma to alpha formation of ferrite is difficult because of the suppression of pearlite precipitation. However, C diffusion is rather active and causes precipitation of carbides. Over the intermediate range, the gamma phase crystals are formed through coherent growth like the martensite plates. But the alpha phase plates are formed slowly rather than instantaneously. This is due to the fact that over the intermediate temperature range the alpha phase can precipitate only from the C depleted gamma phase. Thus the growth rate of the alpha phase crystals depends on the C diffusive removal rate. In this case, the martensite start point Ms in austenite rises and the martensite gamma to alpha transformation takes place at temperatures above the temperature Ms typical of the steel with a given composition. At the instant of martensite transformation, the C concentration remains unchanged. Only the crystal lattice is altered and a supersaturated a solution is formed. Carbide precipitates after gamma to alpha transformation. There is a difference between upper and lower bainite, which are formed in the upper and lower parts of the intermediate temperature range. The conventional boundary between the bainite is close to 350 deg C. Upper bainite has a feathery structure, whereas lower bainite shows an acicular morphology, which is close to that of martensite. The difference in the structures of upper and lower bainite is due to the difference in the mobility of C in the upper and lower parts of the bainite temperature range. The alpha phase substructure of upper bainite resembles the substructure of massive martensite in low C steel, while the alpha phase structure of lower bainite approaches the structure of martensite in high C steels. In upper bainite, carbide particles can precipitate both at lath boundaries and inside laths. This fact suggests that here carbides precipitate directly from austenite. In lower bainite, carbide is found inside the alpha phase. This is since carbide is formed during precipitation of a supersaturated solid solution of C in the alpha phase. Both upper and lower bainite shows a high density of dislocations inside the alpha phase. Fe3C is the carbide phase in upper bainite and epsilon carbide (Fe2C) in lower bainite. As the holding time is increased, Fe2C turns into cementite. The dimensions of austenite grain have no effect on the kinetics of martensite transformation. The processes which take place during tempering are precipitation and recrystallization of martensite. Quenched steel has a metastable structure. If subjected to heating, the structure becomes closer to equilibrium. The nature of the processes which occur during tempering is determined by three major characteristics of quenched steel namely (i) strong super saturation of the martensite solid solution, (ii) high density of crystal lattice defects (dislocations, low angle and large angle boundaries, and twin interlayers etc. ), and (iii) presence of retained austenite. The main process taking place during tempering of steel is the precipitation of martensite accompanied by formation of carbides. Depending on the temperature and duration of tempering, the martensite precipitation can involve three stages namely (i) pre-precipitation, (ii) precipitation of intermediate metastable carbides, and (iii) precipitation and coagulation of cementite. Retained austenite can precipitate simultaneously. Since there is a high density of dislocations in martensite, hence its substructure is similar to the substructure of steel which is work hardened. Hence, polygonization and recrystallization can develop during tempering. When C steel is tempered, super-saturation of the gamma solution in austenite increases with an increase in the C content of steel. This leads to lowering of the Ms-temperature and transition from massive martensite to plate martensite. The amount of retained austenite also increases. The segregation of C represents the first structural changes which take place during tempering of C steel. The segregated C can nucleate heterogeneously at lattice defects or homogeneously in the matrix. The heterogeneous nucleation of the segregated C takes place either during quenching or immediately after it. Flat homogeneous clusters of C atoms not connected with lattice defects are formed at tempering temperatures of less than 100 deg C. This is due to the considerable displacements of Fe atoms and the appearance of elastic distortions. As the tempering temperature is increased, the clusters become larger and their composition is close to Fe4C. This process is dependent on the C diffusion. Metastable Fe2C is formed above 100 deg C. It has a hexagonal lattice and appears directly from C clusters when the C concentration is increased. Metastable Fe2C can also precipitate directly from the alpha solution. Fe2C precipitates as very fine (10 nm to 100 nm) plates or rods at low temperatures. With an increase in tempering temperature or time, Fe2C particles become coarser and precipitate in steels containing a minimum of 0.2 % C. In steels with a high Ms-temperature, partial precipitation of martensite is associated by the deposition of excess carbide and is obtained during quench cooling in the martensite range. Hence self-tempering of these steels occurs during their quenching. Cementite is formed at a temperature higher than 250 deg C. Two known mechanisms of Fe3C nucleation are (i) precipitation directly from a supersaturated alpha solid solution and growth of Fe3C particles at the expense of the dissolution of less stable carbides, and (ii) appearance of Fe3C as a result of transformation of the intermediate carbide lattice to the Fe3C lattice. In the final stage of the carbide formation during tempering, coagulation and spheroidization of carbide take place. These happen intensively starting from 350 deg C to 400 deg C. At temperatures higher than 600 deg C, all Fe3C particles have a spherical shape and undergo coagulation only. A substantial part of the tempering process is devoted to the precipitation of retained austenite accompanied by deposition of carbides. Precipitation occurs over the temperature range of 200 deg C to 300 deg C. During tempering, retained austenite transforms into lower bainite. A decrease in the C concentration of the alpha phase during carbide formation results into changes in the phase structure. Martensite precipitation is conventionally divided into two stages. The first stage of precipitation is achieved below 150 deg C when the mobility of C atoms is sufficient for the formation of carbide plates. But, it is insufficient for the carbide plates to grow by diffusion of C from the areas of non-precipitated martensite with a high C concentration. This results in a non-uniform content of C in different areas of the martensite and hence inhomogeneity of martensite results with respect to its tetragonality. In areas with precipitated carbide, tetragonality is lower than in non-precipitated areas. Two solid solutions with different C concentrations coexist. For this reason the precipitation is referred to as a two -phase precipitation. The two phase precipitation of martensite results from the deposition of new carbide particles in areas containing martensite with the initial C concentration. Carbide particles do not grow at this stage. At the second stage of martensite precipitation (150 deg C to300 deg C the alpha solution is depleted of C owing to diffusive growth of carbide particles, but the process proceeds very slowly. Hence, the precipitation kinetics is due to the rapid depletion of the alpha solution in carbon. Subsequently, depletion of the solid solution in C stops. At 300 deg C around 0.1 % C is left in the alpha solution. Above this temperature, no difference between the lattice of the alpha solution and that of the alpha-Fe is detected. Below 300 deg C the degree of tetragonality is still measurable. Above 400 deg C the alpha solution becomes completely free of excess C and transformation of martensite to ferrite is finished. Plates (needles) of quench martensite have a high density of dislocations which is comparable to the density of the deformed steel. However, recrystallization centres and their progress to recrystallized grains are not observed. This is since carbide particles pin dislocations and large angle boundaries. It is only above 600 deg C, when the density of the particles decreases owing to the coagulation, that the recrystallization growth of grains takes place at the expense of migration of large angle boundaries. With this the morphological structures of lath martensite disappear. These processes are hampered in high C steels as compared to low C steels, since the density of carbides is greater in high C steels. The acicular structure is retained up to the tempering temperature of around 650 deg C.
The structural changes which occur during tempering cause alteration of steel properties. These changes depend on the tempering temperature and time. Hardness decreases as the tempering temperature is increased. The kinetics of transformation of austenite is described below. It is important to follow the process at a constant temperature for the understanding of the kinetics of the transformation to austenite. For this purpose, isothermal transformation (IT) diagram is usually made which illustrates the isothermal process of austenite precipitation. In IT diagram (Fig 2), the transformation time is in the X-axis shown on the logarithmic scale and the temperature is plotted on the Y-axis. From this diagram, the incubation period (left hand curve) can be determined and also the time required for completion of the process (right hand curve). The instant, steel passes the points A3 and A1 during quenching, is usually taken as the zero time reference. The time required to achieve the temperature of the quenching medium is frequently neglected. The start and finish of the transformation are difficult to determine from the transformation curve behaviour at the initial and final sections of the curve. Hence, the lines of the IT diagram generally correspond to a certain final volume which has undergone transformation, e.g., 2 % and 98 % for the transformation start and finish, respectively. The volume value is usually not shown in the IT diagram. In addition to the curves stated above, IT diagram frequently contains intermediate curves corresponding to certain values of the transformed volume, say 20 %, 50 %, or 80 %. A decrease in the transformation rate causes displacement of the transformation start and finish curves to the right, i.e., toward greater duration. This phenomenon can be seen if the quenching heating temperature increases as a result of a decrease in the number of inclusions and growth of austenite grains. An increase in the transformation rate leads to displacement of the curves to the left. This phenomenon can be accounted for (i) by a decrease in the quenching heating temperature, (ii) the presence of carbides or inclusions, and (iii) refinement of the austenite grain. 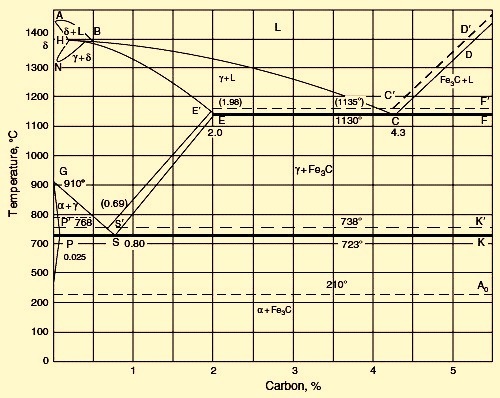 For a specified sample of steel the temperature which corresponds to a maxi mum transformation rate (the nose of the sigmoid curve) does not, as a rule, change significantly. Continuous cooling transformation (CCT) diagrams consider the transformation kinetics of eutectoid steel. The major transformation which takes place during annealing cooling of steel is a eutectoid precipitation of austenite into a mixture of ferrite and carbide. The eutectoid transformation kinetics is given by IT diagrams of austenite at a temperature of 727 deg C. The structure attained after tempering below 300 deg C is called tempered martensite. An acicular structure is seen after tempering at 300 deg C to 450 deg C. Tempering over the temperature interval of 450 deg C to 600 deg C shows a distinct dot structure. Austenite is in a thermodynamically stable equilibrium with the ferrite-Fe3C mixture. Stability of undercooled austenite is defined by a period of time during which the appearance of precipitation products in the diagram cannot be registered by conventional methods. The degree of austenite undercooling is the main factor which determines the steel microstructure. The necessary degree of undercooling is provided by either continuous cooling or isothermal treatment. As seen earlier, in hypo-eutectoid steels the formation of pearlite is preceded by precipitation of hypo-eutectoid ferrite. With a decrease in the transformation temperature and an increase in the degree of undercooling, precipitation of hypo-eutectoid ferrite is suppressed. The amount of pearlite increases and the C content becomes less than that in pearlite of the eutectoid steel. In the region of the maximum transformation rate, the two curves merge. Thus, a purely pearlitic structure is formed in steel with 0.4 % C. In steels containing higher amounts of C, the precipitation of ferrite cannot be suppressed even if the C content decreases. Ferrite precipitation precedes the formation of pearlite even at a maximum transformation rate, but the amount of ferrite is less than that is formed at smaller undercooling. These propositions are valid for the precipitation of cementite in hyper-eutectoid steels, but it can be suppressed even at relatively small undercooling. In this case, the C content of pearlite becomes higher than that in the eutectoid steel. As a result of suppression of the hypo-eutectoid ferrite precipitation under continuous cooling from the region of the gamma solid solution, the point Ar3 lowers much faster than the point Ar1 as the cooling rate is increased. With a certain cooling rate, both points merge into one point, which corresponds to the formation of a fine plate structure of the pearlite type free of ferrite. Under continuous cooling the transformation process can also be visualized as diagram in temperature-time coordinates. Therefore the behaviour of cooling curves is to be analyzed to find characteristics of the transformation processes. In this diagram, the ferrite and pearlite start lines are shifted toward longer periods of time compared to the IT diagram. This is due to an increase in the temperature interval necessary for preparing the transformation processes in the austenite lattice. As a result, only part of the incubation period, which is needed for the IT to start, is effective. In this case, the incubation period is the mean of the effective lengths of time corresponding to different periods of time in the given range. This proposition can be used to calculate the behaviour of the transformation start line in the pearlite range from the IT diagram. The reverse calculation is also possible. Similar to the pearlite range, in the bainite temperature range, the precipitation of undercooled austenite starts after a certain incubation period. Resemblance of the bainite and pearlite transformation kinetics consists not only in the presence of an incubation period but also in the character of the volume increase during isothermal soaking which is the fraction of the transformed volume of austenite increases first with acceleration and then with deceleration. At the same time, as in the case of the martensite transformation, retained austenite does not disappear completely during the bainite transformation. Every point in the bainite finish curve corresponds to certain amount of retained austenite. Similar to the pearlite transformation, the bainite transformation can take place both during isothermal soaking and under continuous cooling. Austenite which has not been transformed over the bainite range turns partially into martensite when the steel is cooled to room temperature. Since the austenite is inhomogeneous with respect to the C content after the bainite transformation, martensite is formed predominantly in C enriched regions. For the high alloy steel, IT curves can be separated by a temperature interval in which undercooled austenite is highly stable. In this interval, pearlite precipitation does not take place for many hours, while undercooling is inadequate for the bainite transformation. In C steel, the bainite transformation proceeds concurrently with the pearlite transformation. Products of the pearlite transformation dominate at higher temperatures, and those of the bainite transformation at lower temperatures. During the transformations of austenite on cooling in the martensite range, martensite component in the steel structure appears when the cooling rate achieves a certain value. The minimum cooling rate at which the martensite component is formed is called the lower critical rate of cooling. The rate at which transformations by the pearlite and bainite mechanisms are suppressed completely is referred to as the upper critical rate of cooling (quenching). If the conditions of austenite formation (austenitization temperature and the holding time at this temperature) and the cooling conditions (cooling rate exceeds the upper critical rate) are constant, the location of the martensite start point Ms depends only on the contents of C and alloying elements in the steel. If the cooling rate is high, the formation rate of separate needles of martensite is also high, and transformation of austenite to martensite begins on reaching Ms-temperature. It continues on subsequent cooling to lower temperatures. As the temperature of the quenching medium is lowered, the amount of formed martensite increases first quickly and then slowly. With an increase in the quenching heating temperature (austenitization temperature), the transformation also shifts toward lower temperatures as more of the alloying elements are taken into solution. A certain amount of martensite can be formed during isothermal holding, but it is not high in C steels. Retained austenite is stabilized during isothermal holding. As a result, more martensite is formed during subsequent cooling. Formation of martensite stops at the point Mf. There is a relationship between some factors which influence the stabilization of martensite. The effect of stabilization increases with the amount of martensite in the structure or, the amount of martensite being equal, with temperature. There is a close link between the CCT and IT diagrams. When resolving practical issues involved in heat treatment of steel, it is sometimes necessary to know how the continuous cooling rate affects the structure formed as a result of austenite transformation. For this, there have been efforts to establish the relationship between the transformation kinetics of austenite under isothermal conditions and under continuous cooling conditions. The efforts have started from the concept of additivity of the transformation processes at different temperatures. It has been presumed that holding of undercooled austenite at a preset temperature is part of the incubation period. However, it has been found, that calculated and experimental data coincide satisfactorily only if the pearlite transformation is continuous. If the pearlite transformation is preceded by precipitation of eutectoid pearlite or the pearlite and bainite transformations occur concurrently, calculated data are at a discrepancy with the experimental data. It has been found that the discrepancy is due to the factors namely (i) holding of austenite during the time accounting for fractions of the incubation period causes acceleration of the subsequent intermediate transformation at the expense of preparatory processes, (ii) precipitation of hypo-eutectoid ferrite alters the austenite composition which delays the subsequent intermediate transformation, (iii) partial transformation of austenite over the intermediate range reduces the rate of the said trans formation at lower temperatures and facilitates an increase in retained austenite which is due to a redistribution of C and enrichment of the non-transformed part of austenite in carbon, and (iv) a change in the cooling rate over the martensite range affects stabilization of austenite in different ways. For the above reason, special methods of constructing thermo-kinetic transformation diagrams of austenite subject to continuous cooling have been elaborated for non-eutectoid steels. From these diagrams it is possible to determine the critical rate of quenching cooling or continuous cooling which is necessary to complete a particular stage of austenite precipitation. It has been seen that the CCT diagram is a function of the bar diameter. When steel is subjected to martensitic hardening, it is required to be cooled from the quenching temperature so that on undercooling to a temperature below the Ms point austenite has no time to precipitate and form a ferrite-carbide mixture. For achieving this, the cooling rate is to be less than the critical value. The critical cooling rate is the minimum rate at which austenite does not precipitate to a ferrite-carbide mixture. Of course, the cooling rate of steel products is non-uniform over their cross section. It can be higher than the critical rate on the surface and lower than the critical rate at the centre. The critical cooling rate at different points of a product can be directly determined from an IT diagram. In the first approximation, it is given by the slope of the tangent to the C curve which denotes the austenite precipitation onset. This method gives a value which is around 1.5 times the true critical rate. The cooling rate can be determined more accurately if thermo-kinetic diagrams are used. Intercepts of the cooling curves with the lines of the thermo-kinetic diagrams show the start and finish temperatures of the corresponding transformation. From the transformation diagram, it is possible to determine, for example, the rate which provides 40 % martensite in the structure or the rates at which the entire transformation occurs in the pearlite range, i.e., hardening is omitted altogether. Because the data on the critical hardening rate depend on cooling time and is to be associated with a specific temperature (at which direct measurements of the hardening rate are practically impossible), it is proper to specify the cooling time for a specific interval of temperature, for example, from the point A3 to 500 deg C. Point A3 in the diagram is the time reference. Then it is possible to directly determine the critical cooling time K (Km for fully martensitic hardening, Kf for initial appearance of ferrite, and Kp for full transformation in the pearlite range). 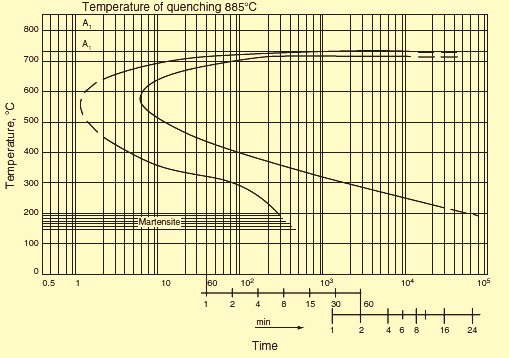 Since the cooling time and the progress of the subsequent cooling of the sample during end-face hardening are known, the outcome of hardening can be determined from the transformation diagram. It is to be remembered that a transformation diagram is valid only for particular conditions of melting and homogenization. Deviations in the composition or grain dimensions cause changes in the trend of thermodynamic curves. This is explained by the fact that an increase in the homogenization temperature and time and, consequently, enlargement of the grains enhance the stability of austenite. Conversely, refinement of grains lowers the critical cooling rate, since stability of austenite decreases with an increase in the extent of grain boundaries. The depth of the hardened zone is termed hardenability. This is one of the most important characteristics of steel. Since the cooling rate is non-uniform along the cross section of a sample, austenite can pass into martensite in surface layers only, while at the centre of the sample austenite undergoes the pearlite transformation. In the first place, hardenability depends on the critical cooling rate. An examination of the temperature curves plotted for different areas of the sample shows that the cooling rate of the core of a large diameter product is lower than the critical value and hence the core is not martensitically hardened. Martensite is present in the surface layer only. After hardening treatment, a bulky part with a large cross section can show the entire range of structures such as a smooth transition from martensite near the surface through troostite-martensite and troostite to pearlite at the centre. The geometry of samples can influence the character of the cooling curves. However, given the same surface-to-volume ratio, the curves coincide in general. The highest changes in the cooling rate are experienced by the diameter of samples. Considering the above, for achieving a through hardening of bulky products or full martensitic hardening to the core of a product, it is essential to provide the critical hardening rate along the entire cross section of the product. IT and CCT diagrams can be used to determine this rate. The diagrams are usually plotted for different grades of steel, taking into account the progress of cooling in different sections and in different hardening media. The hardenability of steels depends on the steel composition, specifically on the C content. In the steel hardenability diagrams, the hardenability of each grade of steel is normally presented as a hardenability band. These diagrams have been plotted for almost all existing grades of steel. They show how to achieve hardening of a product made of particular steel. Hardenability of steel is also categorized by IT curves. The more the curve is shifted to the right along the X-axis, the greater is the hardenability of the steel. This is explained by the fact that the rightward shift of the IT curve is due to better stability of austenite. An improvement in the stability of undercooled austenite and hence an increase in the critical hardening rate lead to a greater depth of hardening. Then hardenability depends on all the factors which improve the stability of undercooled austenite. As an example, the stability of austenite can be raised by alloying steel with chromium and tungsten. These elements lower the austenite precipitation rate and can make steel an air-hardening one. Steel with a normal content of impurities is hardened to strength ten times that of a pure Fe-C alloy. Elevation of the hardening temperature favours an increase in the hardening depth due to the homogenization of austenite and enlargement of austenite grains. Refinement of grains impairs hardenability as grain boundaries affect the stability of austenite. The hardening depth also depends on the hardening medium used. The greater is the intensity of cooling, the greater is the depth of hardening. Besides, the hardening depth depends on the cross-sectional diameter of the products. The critical diameter is that of the greatest cross section which lends itself to through hardening in a given hardening medium. The critical diameter is different for different hardening media and characterizes the hardenability provided by a particular method only. Hardenability has an effect on the mechanical properties of steel. In the case of through hardening, the properties do not differ along the cross section of a product. Otherwise they decrease from the surface to the centre. The analysis of the influence of hardenability on the properties of steels which have been tempered after hardening shows that a high temperature favours equalization of hardness along the cross section. However, the structure of weakly hardenable steels remains inhomogeneous. This is due to a grain structure appearing on the surface, where martensite is formed during quenching, while a lamellar structure remains at the centre. A grain structure is present along the entire cross section of through-hardening steel. This determines the character of changes in the properties of steels with different hardenability. The properties which are independent of the Fe3C form (YS, specific elongation, impact strength) differ. The properties of tempered steels (fracture stress, YS, impact strength, reduction in area) are impaired if ferrite precipitates during quenching. The mechanical properties of a product depend on its cross-sectional area. To obtain the best mechanical properties in the tempered state, a grain structure is required to be provided along the entire cross section; i.e., through hardenability is to be ensured in the quenched state. It is necessary to know the material structure while analyzing any processes or properties associated with grain boundaries. Most of the steel materials have polycrystalline structure and they comprise a set of grains separated by boundaries. The grain boundary is one of the basic structural elements in polycrystalline steel materials. The grain boundary represents an interface between two differently oriented crystals. This is the region of crystal imperfection. It is capable of moving and adsorbing impurities. The boundary has a high diffusive permeability. In polycrystalline steel materials, the boundaries determine the kinetics of many processes. For example, movement of grain boundaries controls the process of recrystallization. A high diffusive permeability of grain boundaries determines the kinetics of diffusion-dependent processes at moderate temperatures. Embrittlement of steel material is connected with enrichment of grain boundaries in impurities. Grain boundaries are normally divided into two large groups namely (i) low angle boundaries, and (ii) large angle boundaries. Low angle boundaries are sub-grain boundaries with an angle of less than 10 degrees. They represent networks or walls of dislocations. The structure of large angle boundaries is much more complicated. The progress in understanding the structure of grain boundaries is connected with elaboration of the models describing the observed microscopic properties of the boundaries. The size of the grain that is formed under a given treatment is determined from micro-sections after their etching. For C and alloyed steels the reagent used is 1ml to 5 ml HNO3 +100 ml ethyl or methyl alcohol. Austenitic steel is etched in a copper sulphate-chloride solution containing 10 grams copper sulphate, 50 ml hydrochloric acid, and 50 ml water. When C and low alloy steels are etched, the reagents turn pearlite dark and make visible the ferrite grain boundaries, the martensite structure, and tempering products. The etching rate rises with the amount of nitric acid. The etching time is from several seconds to a minute. Etching of austenitic steel reveals the austenite structure and the austenite grain boundaries. Carburization is also used to establish the austenite grain boundaries. In this case, samples are heated to 930 deg C in a carburizing medium (e.g., a mixture of 40 % BaCO3 and 60 % charcoal), cooled, and etched. In addition, an oxidation method is used according to which micro-sections are heated in vacuum to a temperature 20 deg C to 30 deg C higher than the quenching temperature and are soaked for 3 hours. Subsequently air is fed to the furnace for 30seconds to 60 seconds, and the samples are cooled in water. Before quenching it is desired to heat samples in borax melt at 930 deg C to 950 deg C for 30 seconds to 40 seconds and then cool them in water. After these treatments micro-sections are polished and etched in a 15 % solution of hydrochloric acid in ethyl alcohol. Grain boundaries are seen as the oxide network. Apart from this, use is made of the method of etching austenite grain boundaries, the method of the network of ferrite (for steels with a C content of up to 0.6 %) or Fe3C (for hypereutectoid steels), and the method of the pearlite network for steels which are closer in composition to eutectoid steels. The grain size is determined by comparing the observed microstructure at a 100x magnification with standard scales (the scales are elaborated so that at a magnification of 100x the grain number N corresponds to the formula ‘n = 8 X 2 to the power n’, with n the number of grains per sq mm of the micro-section area) or by counting the number of grains per unit area of the micro-section, or by calculating the mean nominal diameter of the grains or their number per cubic millimeter. The austenite grain boundary structure which is produced on heating above the critical points is important since the austenite transformation products formed during cooling (martensite and pearlite etc.) appear inside austenite crystals. A coarse austenite grain determines a coarse plate structure of martensite during quenching or a coarse cellular network of ferrite (cementite) precipitates at the boundary of the initial austenite grains during annealing or normalization. The pearlite structure is also the coarser and the larger is the pearlite grain. As is known, a coarse grain structure of steel (ferrite-pearlite, martensite, etc.) is characterized by lower mechanical properties. For this reason a fine-grain structure of steel is desirable in practice. It is possible to refine a coarse-grained structure and this is widely used in the heat treatment of steel. The grain refinement, which takes place on heating steels above the Ac3 temperature, is related to a transition to the austenite state through nucleation of numerous centres of the austenite phase. Development of these centres leads to formation of a relatively fine grained structure. Above Ac3 temperature, the cross sectional size of the grain is 10 mm -30 mm. Initially the grain size is independent of the grain of the starting structure. It can be very fine irrespective of whether the starting structure of the steel is fine or coarse. A fine grain structure of the restored austenite provides a fine grain structure of cooled steel irrespective of the structural components (pearlite, bainite, or martensite) which are formed. This is due to the fact that all the transformation products nucleate within each separate grain of austenite. Excess phases (ferrite in hypo-eutectoid steel and Fe3C in hyper-eutectoid steel) precipitate at boundaries of small austenite grains, and the pearlite transformation is accompanied by the appearance of smaller pearlite colonies. Fine austenite grains determine the formation of fine-needle martensite. This underlies the grain refinement effect which is associated with heating above Ac3 temperature. Heating the steel above Ac3 temperature during full annealing, normalization, or quenching is followed by recrystallization. With an initially coarse grain structure, recrystallization results in refinement of grains at a heating temperature corresponding to Ac3 temperature. If the heating temperature is much higher than Ac3 temperature, then the grain is enlarged again, and the expected correction of the structure during the gamma to alpha transformation does not take place. Refinement of crystallites is especially pronounced when transformation to the austenite state starts in many centres inside the initial structure. The formed centres are to have a random orientation, which is not connected with the orientation of the alpha phase in the initial structure. Normally such centres are sufficiently large in number so that the grain size does not exceed 15 mm to 30 mm. During pearlite precipitation of austenite, breaking of an austenite grain into pearlite colonies, each of which can be considered an independent grain, also represents refinement of steel. There are four strengthening mechanisms in steel namely (i) solid solution strengthening, (ii) grain size refinement, (iii) dispersion strengthening, and (iv) work hardening. Solid solution strengthening is a phenomenon which occurs when the number of impurity atoms in the lattice of the basic element is so small that they are incapable of forming both stable and metastable precipitation phases under any heat treatment conditions. However the impurity atoms favour improvement of the mechanical properties. The presence of impurity atoms in the matrix lattice leads to distortion of the lattice because of the difference in size between the atomic radii of the impurity and the basic component. This in turn leads to the appearance of elastic deformation fields, which retard movement of dislocations in slip planes under the action of applied stresses. In addition, the impurity atoms can obstruct movement of dislocations by forming impurity atmospheres around them. Both of the above factors play a leading role in solid solution strengthening. Carbon which is statistically uniformly distributed in the lattice of the alpha iron has an influence on the structure and properties of alpha iron. Solubility of C in alpha iron is much lower than in the gamma iron. It forms interstitial solid solutions with both types of irons. However, whereas the gamma iron lattice has sufficiently large pores for implantation of C atoms, the cubic lattice of the alpha iron suffers. Upon introduction of C atoms, a tetragonal distortion takes place which is similar to the one of the martensite lattice except that in the former case the distortion is much smaller. In addition, inserting of C atoms causes the entire lattice of the alpha iron to somewhat expand. Hence, C affects the properties of the alpha phase. Actually, there is a dependence of the YS on the C concentration in the solid alpha solution. The influence which C exerts on plastic deformation resistance of the alpha phase is due to its strong interaction with dislocations as well as pinning of the dislocations and elastic deformations arising as a result of the tetragonal distortion of the alpha phase lattice after insertion of C atoms. The presence of C in lattices of different structural components formed during thermal treatment of steel also leads to changes in their mechanical properties. As an example, the location of inserted C atoms primarily in one of the sub-lattices of interstitial sites during the martensite formation brings about additional tetragonal distortions of the martensite crystal lattice. This enhances plastic deformation resistance owing to the interaction between the stress fields around C atoms and those at dislocations. The influence of C dissolved in the alpha phase on the mechanical properties of steel is also witnessed in the case of the ferrite – pearlite transformation. The dissolution of part of the C in the alpha phase suggests that the solid solution strengthening of the phase is one of the factors providing the high strength properties of intermediate transformation products. Grain size refinement of steel has a strengthening effect on steel. Impact strength is especially sensitive to the austenite grain size, and it decreases with grain enlargement. A decrease in the dimensions of pearlite colonies inside the initial austenite grain also favours a rise in impact strength. Although the grain size has a considerable effect on impact strength, its influence is small if any on the individual mechanical properties such as hardness, fracture stress, YS, and specific elongation. Only the actual grain size affects steel properties, the inherited size has no effect. However, the technological process of heat treatment is determined by the inherited grain. In the steels, precipitation of supersaturated solid solutions formed during quenching is followed by precipitation of disperse particles enriched in atoms of the alloying components. The strength (hardness) of the steels increases with the precipitation of these particles. The increment in the value of these characteristics increases as the dispersion and volume fraction of the particles increase. This phenomenon has been referred to as dispersion strengthening. Precipitation of supersaturated solid solutions takes place during the heating (aging) of quenched steels. The strengthening is due to an increase in resistance to the movement of dislocations in a crystal when obstacles (barriers) of any type are formed. In aging steels, dislocations meet regions which retard their movement. The character of interaction between moving dislocations and precipitates of the second phase can be different depending on the phase morphology and structure. The total effect of aging on the strength properties of steels is determined by (i) the strength of the precipitates formed, (ii) the volume fraction of precipitates, (iii) the degree of precipitate dispersion, (iv) morphology, structure, and type of binding with the matrix, and (v) temperature. When a solid solution of C in alpha Fe is cooled below A1 temperature, C precipitates as Fe3C with lowering of the C solubility and a decrease in temperature. This process takes place under sufficiently slow cooling, which is accompanied by diffusion processes, leading to the formation of cementite. In the case of abrupt cooling (water quenching) C has no time to precipitate. A super-saturated alpha solid solution appears. During subsequent storage at room temperature (natural aging) C tends to precipitate from the solid solution. Carbon enriched regions appear primarily in defective sections of the matrix. Precipitation of C from a supersaturated solid solution during natural aging results in an improvement of its strength properties and hardness. However, plastic properties such as reduction in area, specific elongation, and impact strength are deteriorated and the phenomenon of dispersion strengthening is seen. As the heating temperature is increased (artificial aging), dispersion strengthening accelerates. This is due to the intensification of diffusion processes with an increase in temperature. The total process of C precipitation from the super-saturated solid solution in alpha Fe comprises several successive processes. Mechanical properties and hardness are not sensitive to structural changes which take place during the aging of the steels. Sharp changes in properties indicate alterations in the structural state of the steel. A maximum change in mechanical properties during precipitation is achieved only if excess crystals in a highly disperse state precipitate. Subsequent coagulation of the crystals leads to degradation of the properties. The influence of different solubilities of C in alpha Fe on the properties of the steel (dispersion strengthening) during low temperature aging is prominent in low C steels. In steels containing C higher than 0.4 %, the above effects are not noticed due to the influence of Fe3C particles formed during the pearlite transformation. Besides, nucleation of the precipitating phase can be inhibited owing to migration of C to the Fe3C-ferrite interfaces. As a result, the amount of C concentration at lattice defects decreases. Cold plastic deformation greatly accelerates precipitation of a supersaturated solid solution. This is due to an increase in the density of dislocations, which are preferable sites of heterogeneous nucleation of precipitates as well as to an increase in the concentration of vacancies, which facilitates the diffusion of C to clusters. Mechanical properties change during aging after cold working in the same way as after quenching, that is, the YS, the fracture stress, and hardness are altered. With an increase in aging time, specific elongation and reduction in area decrease and the tendency to brittle fracture is enhanced. The rate of change is higher than in quenched steel. Also, the nature of the changes is different. Whereas in the case of aging after quenching, hardness reaches a maximum and then drops, after cold working hardness does not decrease with the aging time. As the aging temperature is raised, the maximum hardness of quenched steel lowers, while after cold working hardness is independent of the aging temperature. This is explained by the fact that a considerable amount of C is concentrated near dislocations. Few, if any, clusters nucleate in the matrix homogeneously. Consequently, clusters cannot grow at the expense of other clusters, i.e., they cannot coagulate. An important method used to strengthen steels is deformation strengthening. Strengthening achieved with crystal deformation can be judged from the shape of stress-strain curves. The actual shape of these curves largely depends on the crystal lattice type of the metal, its purity, and thermal treatment. In the case of cubic lattice steels, strengthening curves are parabolic, whereas for hexagonal lattice metals a nearly linear dependence is observed between the stress and the strain. This fact suggests that plastic deformation strengthening is determined mainly by the interaction of dislocations and is associated with the structural changes which retard the movement of dislocations. Metals with a hexagonal lattice are less prone to deformation strengthening than cubic lattice steels because the hexagonal lattice has fewer easy slip systems. In cubic lattice steels, the slip proceeds in several intersecting planes and directions. There are three stages during the work hardening. The first stage is due to the easy slip. It depends on the orientation of the crystal relative to external forces and on the presence of impurities. This stage is characterized by a linear dependence of strain stresses on the strain at a small work hardening rate. Dislocations usually slip in primary systems. In the second stage the work hardening rate is much higher than the first stage. Dislocations move in intersecting slip planes and, on colliding, form additional obstacles to their movement. This state is most extensive in the stress-strain curve. The ratio between the work hardening rate and the shear modulus (or any other elastic constant) is almost independent of the applied stress and temperature. It depends little on the crystal orientation and presence of impurities. In the third stage changes are possible in the distribution of dislocations. They can either get around obstacles which retard their movement at the second stage or interact with dislocations. As a result, the work hardening rate is lower compared to which is observed during the second stage. At this stage, a partial relaxation of stresses can occur owing to the appearance of the secondary slip system. The reduction of distortion can have the result that deformation continues in the primary system, which gets rid of a certain number of dislocations passing to the system. A characteristic feature of deformation in the third stage is the development of a cross-slip representing the main mechanism by which dislocations bypass the obstacles formed in the second stage. There are three basic processes for the heat treatment of steels. These are (i) annealing, (ii) quenching, and (iii) tempering. Annealing process of steels has different methods namely (i) diffusion annealing, (ii) softening, (iii) phase recrystallization annealing or full annealing (normalization, high temperature or coarse grain annealing, and pearlitization), and (iv) stress relief annealing and recrystallization annealing. The objective of diffusion annealing is to eliminate, as far as possible, in-homogeneities in the chemical composition, in particular liquation in-homogeneities, which occur during crystallization of steels. This annealing is usually carried out in the range of the gamma solid solution at a temperature of 1100 deg C to 1300 deg C. Diffusion annealing can be used primarily to smoothen out a difference in the content of alloying elements, the difference being due to the inter-crystal liquation. This shows up as smearing of dendrites with an increase in temperature and heating time. Differences in micro-hardness are removed simultaneously. The overall hardness of the steel decreases since liquation regions possessing high hardness is removed. Some average hardness is attained. The success of diffusion annealing largely depends on the steel purity and liquation. This type of annealing is generally used to improve properties of medium purity steels. Softening is used to produce the structure of globular pearlite. This structure is very soft and readily lends itself to deformation during drawing and cold rolling etc. Steels with a low C content become too soft after this annealing treatment. The globular pearlite structure is favourable in steels with a C concentration of more than 0.5 %. Another goal of softening is to produce a uniform fine structure with finely dispersed C after quenching. The simplest method of softening consists in holding for many hours at a temperature slightly above Ac1 temperature. In this case, martensite which is left from the previous treatment is removed and the work hardening caused by cold working is eliminated. Cooling after softening can be done in air starting from 600 deg C. Refinement of the structure subjected to softening is achieved only above the point A1 temperature. Phase recrystallization annealing consists of a twofold gamma to alpha transformation, which takes place during this annealing. It leads to the appearance of a fine grained uniform structure differing completely from the initial structure. Refinement of the grain during normalization results in the disappearance of the Widmanstätten and coarse grained cast structures, which have poor mechanical properties. Inhomogeneity of the structure in the work hardened state is removed. The closer the annealing temperature is to Ac3 temperature and the shorter the holding time at this temperature, the finer is the grain. Refinement of the grain structure is also facilitated if the heating rate to the annealing temperature and the cooling rate from this temperature are increased. In the case of normalization, cooling is done in air. Here it is important to allow for different rates of cooling along the cross section of large sized products. The arising thermal stresses are removed by stress relief annealing or high temperature tempering. To obtain a fine grained structure, rapid cooling is done only over the transformation temperature interval. The normalization heating temperature is not to be much higher than the transformation point, or else the grain may be too coarse (overheating). An excessively long holding time also have the same result. The optimal heating temperature is determined by the C content. Stress relief annealing and recrystallization annealing removes macroscopic stresses which are present in cold worked steels due to the dislocation pile ups and crystal lattice distortions. Normally these stresses are very high. Changes in properties which occur during the cold working can be rectified during subsequent heating. The greater is the degree of cold working, the lower is the heating temperature. Depending on the temperature and time of annealing, various structural changes take place in a cold worked material. The changes are divided into recovery and recrystallization processes. Recovery is a totality of any spontaneous process of variation in the density and distribution of defects before the onset of recrystallization. If recovery proceeds without the formation and migration of sub-grain boundaries inside the recrystallized grains, it is called restoring. If sub-grain boundaries are formed and migrate inside the crystallites, recovery is referred to as polygonization. Restoring does not include an incubation period. Properties start changing right at the beginning of annealing. Restoring is accompanied by a redistribution of point defects whose concentration decreases subsequently from excess concentration to the equilibrium concentration. Simultaneously, dislocations are redistributed and unlike-sign dislocations are annihilated. The structure of steel starts changing drastically from a certain annealing temperature. New rather equilibrium grains are seen along with extended cold worked grains. They differ from the grains of the deformed matrix by having a more perfect internal structure. As distinct from the polygonized structure, recrystallized grains are separated from the matrix with large angle boundaries. The formation and growth of grains with a more perfect structure which are surrounded by large angle boundaries at the expense of initially cold worked grains of the same phase is called primary recrystallization. Recrystallization begins with an incubation period. The recrystallization rate increases initially from zero to a maximum and then decreases due to an ever rising number of new grains in contact with one another. Inclusions of insoluble impurities (carbides, nitrides) lower the tendency to growth of recrystallized grains. This is especially important in the case of ferritic steels, which are prone to grain growth. Another phase can precipitate during recrystallization in alloy steels which are subjected to a strong cold working. Sometimes the intensive growth of individual crystals can be seen after a strong deformation and long holding (for several days) at temperatures close to the melting point. This phenomenon is called secondary or collective recrystallization. Quenching is the strengthening treatment. It consists of cooling from the temperature range of the solid solution at such a rate that transformation in the primary and bainite ranges are suppressed and martensite is formed. In this state, steel has the property of the highest hardness. There is a distinction between (i) normal quenching, which is used mainly for treatment of medium C and high C steels, and (ii) quenching after a thermo-chemical treatment (carburization, high temperature cyaniding etc. ), which is used for low C steels. In case of normal quenching for providing a required cooling rate during quenching, different cooling media and methods are used. Water, oil, or air can serve as the cooling medium. Many alloy steels, which have a high stability of austenite, are subjected to step quenching. With this method of quenching, the temperature drop is less than in the case of direct cooling to room temperature and consequently quenching stresses are less. Some quantity of austenite is retained during quenching even in steels with a relatively small C content. For this reason it is impossible to impart the maximum hardness to a product. Since austenite is stable at room temperature and passes to martensite at lower temperatures, steels are being given a subzero treatment. Under this treatment quenching is continued and steels with a high content of retained austenite are immersed in liquid nitrogen (N2) or quenching mixtures whose temperature is below 0 deg C.
For surface quenching (if it is necessary to harden only the surface layer to a preset depth), special quenching heating schedules are used. The surface of the steel is fully heated, while the core is cold and remains unquenched on subsequent fast cooling. The selection of steel for surface quenching is governed by the sensitivity of the steel to quick heating and cooling. For this reason the C concentration is limited to 0.7 % to prevent cracking of the steel. Among the quenching defects, the main defects are excessive holding and overheating. They show up as enlargement of martensite needles and coarse grain fracture. This leads to a high brittleness of quenched steel and the formation of cracks. Cracks are frequently formed at the boundaries of initial austenite grains. A low quenching temperature or too short a holding time at the given temperature causes incomplete quenching. In this case, the quenched steel is insufficiently hard. Carburization is the thermo-chemical treatment which is associated with surface saturation of steel with C and N2. These elements quickly dissolve in Fe by the interstitial method and are capable of rapid diffusion to a considerable depth. Low C steels are subject to carburization. Carburization is usually carried out at 900 deg C to 950 deg C. Gas carburization is used mostly, under which steel is heated in the atmosphere generated from a gas which contains predominantly methane (CH4) or from liquid hydrocarbons (kerosene and gasoline etc.). Carburization is aimed at enrichment of the surface layer with carbon. The required strengthening of the surface layer is achieved by quenching, which is done after the carburization. The specific volume of the quenched carburized layer is higher than the specific volume of the core, and hence considerable compression stresses arise in the layer. This improves the fatigue strength of the steels. Cyaniding consists of the saturation of the surface of steels with C and N2 in a cyanide-containing salt bath. The C-N2 ratio in the diffusion layer is controlled by changing the medium’s composition and the processing temperature. Advantages of cyaniding over carburization consist in a shorter processing time and improvement in the wear and corrosion resistance (owing to the presence of N2 in the surface layer). The main purpose of tempering is to provide a disperse structure at a preset degree of cooling. In the case of low C steels, quenching serves as tempering even if the steel is not subjected to high temperature tempering it has a high viscosity and a relatively high strength. When some of the steels are quenched in oil, a structure is formed even during transformation in the bainite range which is more disperse than the one formed after cooling in air. But the most disperse distribution of carbides and the most favorable properties are obtained after martensite tempering. The structure dispersion has the highest effect on the YS. An improvement of the fracture stress and YS and an increase in the fracture stress -YS ratio can be taken as a measure of the tempering efficiency. The tempering efficiency depends on the cross-sectional area and on the content of C and alloying elements in the steels. Although to achieve a thorough quenching the critical quenching rate has to be exceeded over the entire cross section, full tempering does not require this procedure. As an example, in quenched steel which has martensite in the surface zone and pearlite in the core, the hardness of the core can sometimes be higher than that of the surface zone after tempering. This is particularly the case during a short tempering when precipitation of carbides from martensite proceeds faster than the coagulation of pearlite plates. Tempering of hypo-eutectoid steels which do not contain free ferrite gives a uniform improved structure. In the presence of ferrite precipitates, the fracture stress-YS ratio decreases and the impact strength is lesser than in the surface zone. Hence, in selecting the content of C and alloying elements and particular conditions of austenitization and cooling, the size of the steel product to be tempered is required to be considered. For tempering to give adequate properties, it is often enough to suppress the formation of ferrite during continuous cooling. Only when a very high fracture stress is required an abrupt cooling is used for tempering. In this case, susceptibility to full tempering can be improved by raising the quenching temperature and thus enlarging the austenitic grain size.